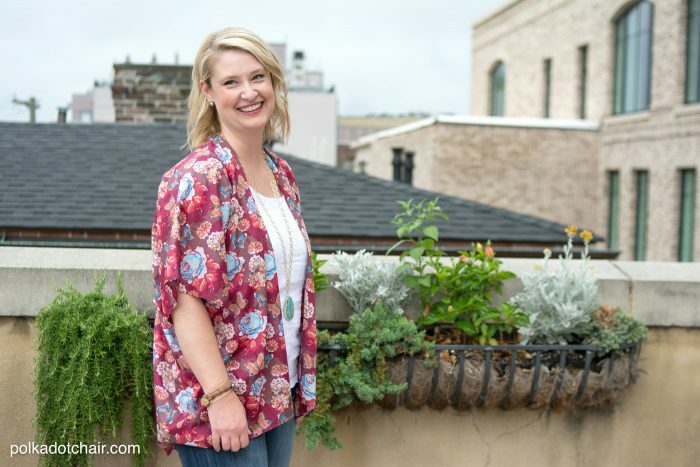 If you’re in need of a stylish yet cool top to wear this summer, then you may like this free tutorial teaching you how to sew a kimono top. I stitched this one up last summer and already have plans to make a few more. If you like this project then you may also like this Summer T-Shirt Sewing Pattern. This top is easy to make, the hardest part will be hemming the lightweight fabric but I’ll give you a few tips for doing that. I wore the top last summer on our trip to Charleston. It was a million degrees outside and I wanted to look stylish (because, Charleston is one of the most stylsih cities I’ve ever been to) but wanted to stay cool at the same time. Since it’s such a large project I really couldn’t get great photos of the process so I’ve illustrated over my photos to give you a good idea of how the top is constructed. 2 yards of 45″ wide lightweight fabric like a voile or light rayon. 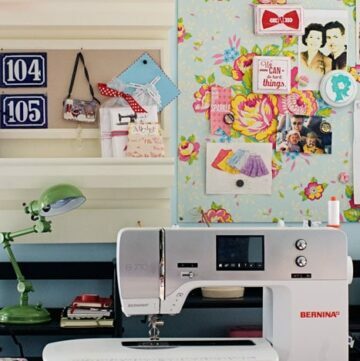 If you buy 60″ wide fabric you’re going to just need to cut it down. Rolled Hem foot for your machine if you have one. Fold the fabric in half lengthwise. It will be 45″ long by 30″ tall (cause it’s folded) with a fold at the top, and the selvage edges on each end. Find the center of the fabric and mark it with a piece of chalk. 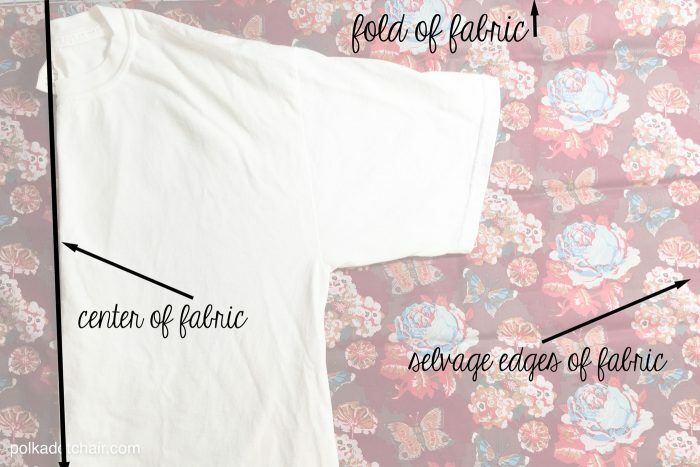 Fold your t-shirt in half and place the fold on the center mark of the fabric, the neckline of the t-shirt even with the fold on the top of the fabric. 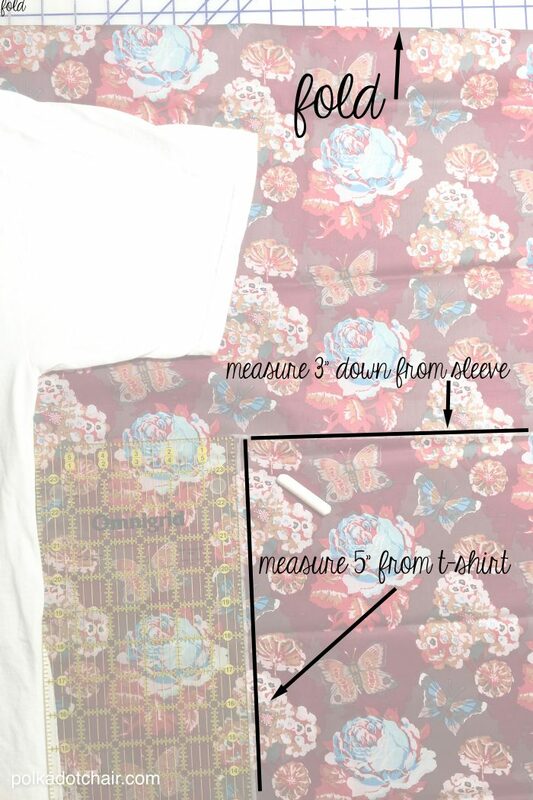 Using a ruler and chalk, measure in 5″ from the edge of your folded t-shirt. Draw a line. Then measure down 3″ from the bottom of the sleeve of the t-shirt. Draw another line. Cut the fabric away. 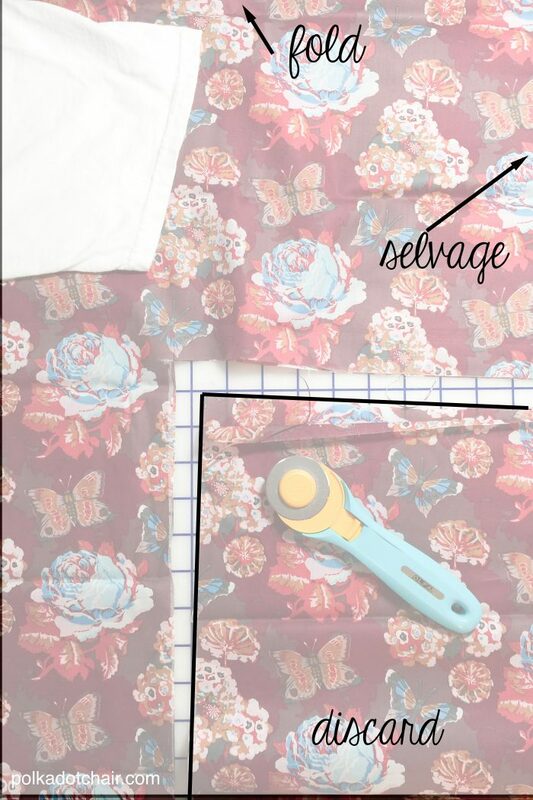 Take the cut away piece and use it to cut a piece EXACTLY the same size on the other side of the fabric. Your piece will roughly look like this. 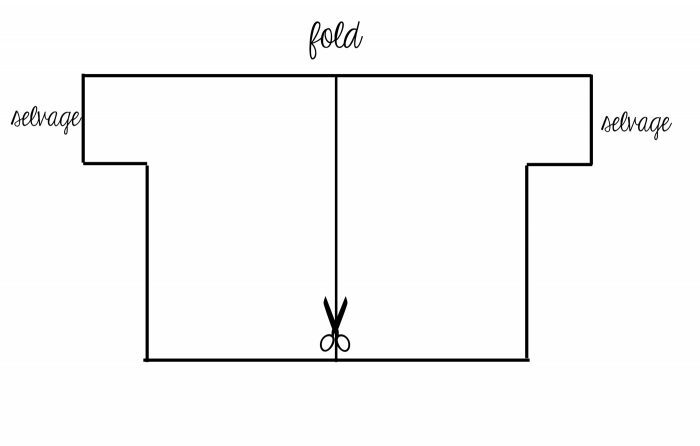 Now with a sharp pair of scissors, cut ONE layer of the fabric along the center line up to the fold. DO NOT cut both layers of fabric. Just the top. With the right sides of the fabric facing stitch the underarm seams. Press seams open. Now all you need to do is to hem all of the raw edges of the fabric. I like to use a rolled hem foot for this step. 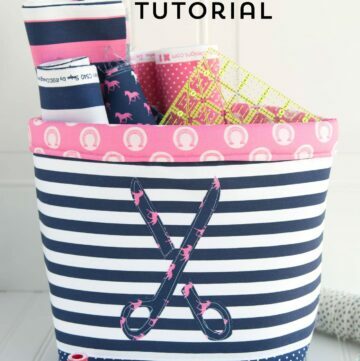 If you don’t have one, then fold the fabric over 1/8″ and fold it again 1/8″ and stitch along the folded edge. This would be a good jacket for a beginning sewer. 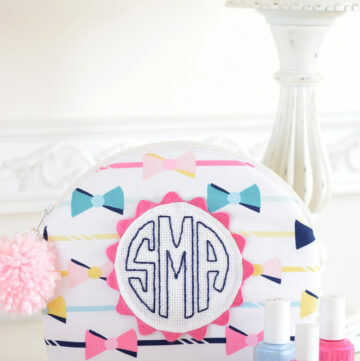 I like the fabric colors and pattern. How did you finish the back neckline? It looks like it might be a bit tricky at the back center neck. I just folded the back neckline under the same 1/8″ as the hem. It took a bit of pressing to get it to lay just right but I was able to work it out. I don’t understand isn’t “long” and “tall” the same measurement…both vertical measures? Plz state which is length and which is width, I might be able to understand then. The back isn’t cut at all. No seam you’re just using the T-shirt to guide cutting the sleeves correctly. And next the discard piece is used on the opposite side for the same purpose. Then when you have a shirt shape with the fold at the shoulders, you cut ONE layer on the straight line down the fabric from bottom edge center to the center of the fold so that it’s open on front and not on the back after the sides and sleeves are sewn. Is the only fold at the top of the fabric so the back has a center seam?? Thanks. I too am confused. 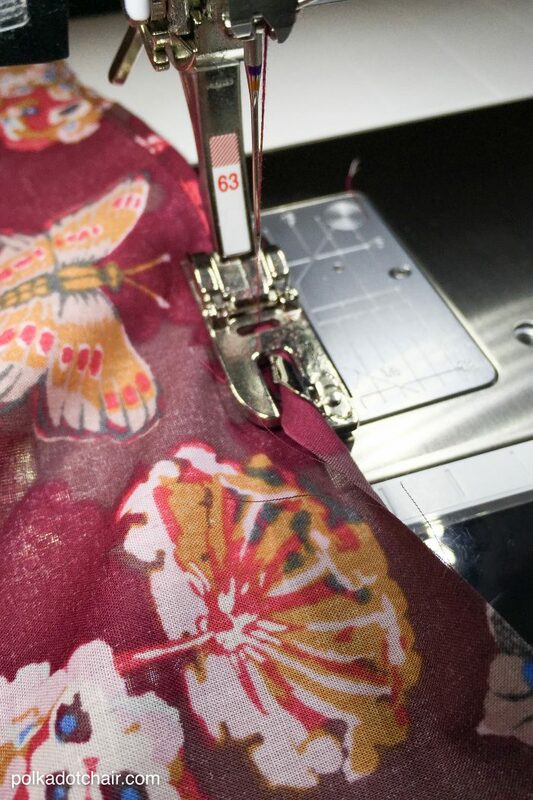 It seems as though “Take the cut away piece and use it to cut a iece EXACTLY the same size on the other side of the fabric” means no fold at the top. Maybe it works out when one is doing it. Uncertain. I have been looking for a kimono pattern so was delighted to find this I don’t wear t-shits, so how would I fit this? M machine doesn’t have such a foot. How do I finish the edges? Love this. I don’t like my arms uncovered and finding something light to wear over short or sleeve less tops for a woman my age is nearly impossible. Thanks for posting it. 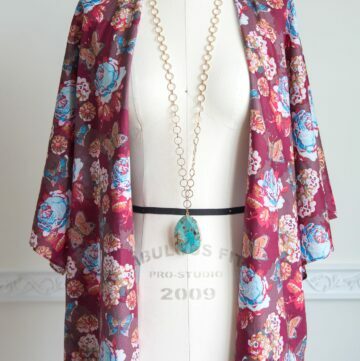 If I wanted to make this kimono top long sleeved would that work? How would you do it? Thank you, love the top! And also, I’ve got a solid blue coloured cotton viole, would that work for this top? Hi! I’m sorry but it’s not printable by design. I’ve had many, many problems in the past with people printing the pages and projects from my blog and selling them in shops and on etsy. I really like this pattern. I was wondering if I can use a slightly heavier fabric like brocade for this project? I don’t think that would work. A brocade would have a heavy drape and part of why this pattern works is that the fabric is very lightweight and breezy.. 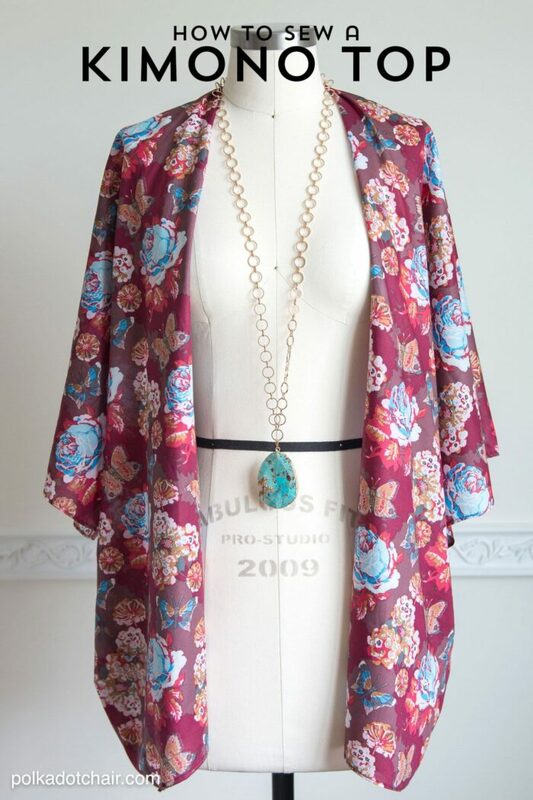 If you allow for the differences in drape and weight almost any fabric can be used for this jacket. I have made a similar jacket, using a very heavy wool remnant: 60″ wide by 3 yards long. It was a dark grey and I had a piece of dark green crushed velvet, upholstery weight, that I lined it with. Just cut it double, sew it right sides together, except for enough to turn it, then handstitch the opening. The extra width and length made it wrist and knee length, so it was warm enough for winter. When I wanted elegant I flipped it inside out so that the wool became the lining. Would it be easier, for a beginner, to hem the edges BEFORE sewing the underarm seams? No, I don’t think so. I think that would be harder. 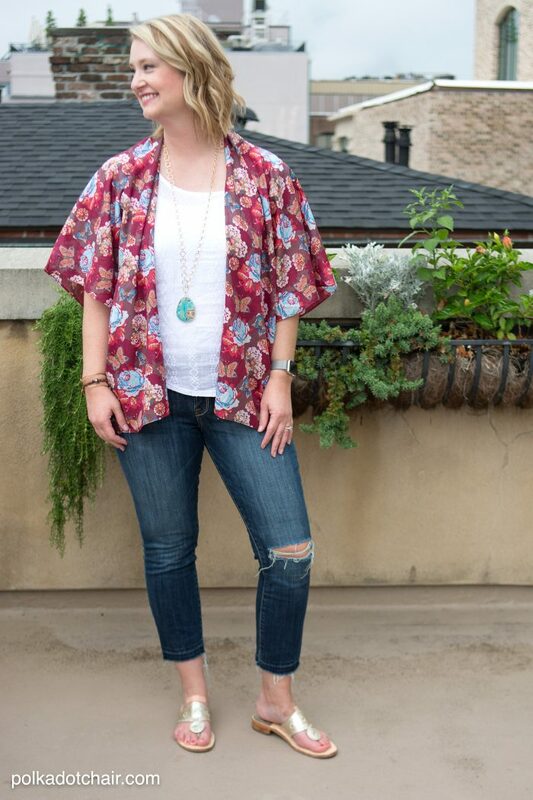 Thanks for this tutorial – I made a kimono, I’m basically a beginner, but managed – I used an overlocker on the underarm and side seams, and a narrow hemming foot for the rest. I also added belt loops and a belt, although I think they might not be successful, we’ll see. It’s a dressing gown for my sister for Christmas. Can you please explain to me how did you make the neck. You just fold the two edges under a tiny bit until they come to the center point.